The HTC One XL is strictly an amazing phone, loaded with fantastic features, which let you browse the internet, click pictures with outstanding image quality, listen to music and also play games. Experience superior picture quality and clarity on the HTC One XL; as it boasts a sharp and bright 4.7-inch Gorilla Glass screen having a 1280 x 720 resolution. HTC One XL features the Android v4.0 Ice Cream Sandwich operating system with HTC Sense 4 for smooth functioning. The Dual-core 1.5 GHz Krait Processor of this phone is fast and efficient that will allow the user to perform multiple tasks and switch between applications with ease. The phone also has a 1 GB RAM. This HTC phone being Wi-Fi compatible, you can hook it up to the World Wide Web. You can surf the net, download various applications as well as send and receive emails with ease. Sharing pictures, videos and music is now very easy; as the phone is enabled with Bluetooth and USB 2.0. DLNA and HDMI are the other connectivity options which the phone supports. The HTC One XL comprises of a variety of entertainment features to bring some fun and enjoyment in your life. Enjoy enhanced sound output; as it boasts the beats audio technology. 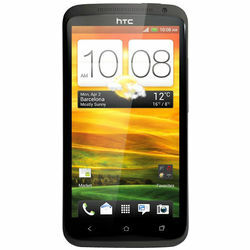 You can listen to your favorite radio station with complete clarity; as this HTC phone has FM radio. Low Light or Bright Light! In any lighting situation, you will always get the best pictures. The phone is fitted with an 8 megapixel camera with HTC ImageSense. The phone even has a front facing 1.3 MP camera. To enhance your picture quality it has a smart LED flash and auto focus. To meet the lighting problems, it is enabled with the BSI sensor. If you like making video clips this is the best deal for you; as the phone has HD video recording feature, which gives clarity to your videos. While you video shoot, you can simultaneously capture photos. And the Video Stabilization function ensures that your images are not blurred due to handshake. You will thoroughly enjoy the HTC experience; as this phone is loaded with the Ambient light sensor, Gyro sensor, Proximity sensor, Digital compass and G-Sensor. The HTC One S perfectly understands the need for a long battery life. You can now communicate to your heart’s content with the 1800 mAh battery, which provides an excellent battery life to the phone even under maximum usage. The phone comes with a remarkable internal storage capacity of 16 GB. What’s more, with this HTC Desire you can store up to 25GB of data for free on the Dropbox cloud storage for 2 years. The HTC One XL is strictly an amazing phone, loaded with fantastic features, which let you browse the internet, click pictures with outstanding image quality, listen to music and also play games. Display Experience superior picture quality and clarity on the HTC One XL; as it boasts a sharp and bright 4.7-inch Gorilla Glass screen having a 1280 x 720 resolution. Operating system Life made easy! HTC One XL features the Android v4.0 Ice Cream Sandwich operating system with HTC Sense 4 for smooth functioning. The Dual-core 1.5 GHz Krait Processor of this phone is fast and efficient that will allow the user to perform multiple tasks and switch between applications with ease. The phone also has a 1 GB RAM. Connectivity This HTC phone being Wi-Fi compatible, you can hook it up to the World Wide Web. You can surf the net, download various applications as well as send and receive emails with ease. Sharing pictures, videos and music is now very easy; as the phone is enabled with Bluetooth and USB 2.0. DLNA and HDMI are the other connectivity options which the phone supports. Multimedia Awesome Musical Experience! The HTC One XL comprises of a variety of entertainment features to bring some fun and enjoyment in your life. Enjoy enhanced sound output; as it boasts the beats audio technology. You can listen to your favorite radio station with complete clarity; as this HTC phone has FM radio. Low Light or Bright Light! In any lighting situation, you will always get the best pictures. The phone is fitted with an 8 megapixel camera with HTC ImageSense. The phone even has a front facing 1.3 MP camera. To enhance your picture quality it has a smart LED flash and auto focus. To meet the lighting problems, it is enabled with the BSI sensor. If you like making video clips this is the best deal for you; as the phone has HD video recording feature, which gives clarity to your videos. While you video shoot, you can simultaneously capture photos. And the Video Stabilization function ensures that your images are not blurred due to handshake. Sensors You will thoroughly enjoy the HTC experience; as this phone is loaded with the Ambient light sensor, Gyro sensor, Proximity sensor, Digital compass and G-Sensor. Memory and Battery The HTC One S perfectly understands the need for a long battery life. You can now communicate to your heart’s content with the 1800 mAh battery, which provides an excellent battery life to the phone even under maximum usage. The phone comes with a remarkable internal storage capacity of 16 GB. What’s more, with this HTC Desire you can store up to 25GB of data for free on the Dropbox cloud storage for 2 years.